I've just finished my first version of the site in the PHP scripting language. The presentation of the website has not been changed, but I hope to find some time to improve it. Today, I updated several links and added a few one (mainly in the miscellaneous section). Hello, I'm learning to use the scripting language PHP and the MySQL database. Thanks to this, I hope to improve the quality of the website and to have an easier way to manage it. Currently, only the main page has been converted to this new system, but a lot of changes will appear in the following weeks. Benoit Mandelbrot, one of the most important persons in the fractal community, has been awarded the Japan prize in the category science and technology of complexity for his work. A new gallery is available. It contains 12 new fractals created with Flarium24. Sorry for the lack of updates of these last months. I didn't forgot fractalzone. I hope to finish a new gallery in a few weeks. The site has moved to a new webhosting company (Nexen). The transition has been smooth but if you see any problem, please contact me. A small board game called Poulpy and developped by Benoit Peschaud uses as background the fractal Depth from my gallery Winter. It consists in aligning pawns. If you get a full line, you win. The rules are very simple, but this is not as easy as it seems. Try it! 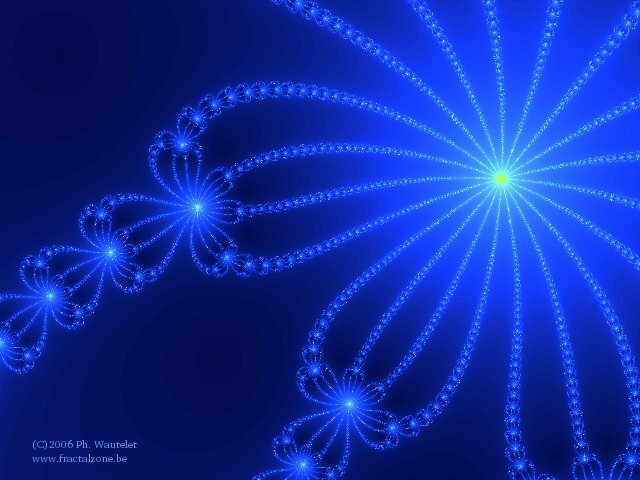 Yesterday, FractalZone has been added to the Fractal Artists' Ring. It links to various beautiful fractal sites. You can access to the ring on the gallery page.